Pecan cookie is one of the most popular kinds of homemade cookies. If you like pecan nuts in your cookies, don't forget to celebrate the National Pecan Cookie Day on September 21. 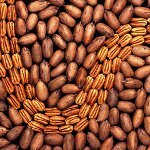 Pecans are the fruit of Carya illinoinensis, also known as the pecan tree. It is a species native to Mexico and southcentral and southeastern United States. Pecans are not nuts in a botanical sense, but they are referred to as nuts in culinary. They are widely used in cooking, particularly in desserts such as pecan pie, pecan cookies, and praline candy. To celebrate the National Pecan Cookie Day, bake some delicious cookies. Here is an easy recipe. Place 1 3/4 cups chopped pecans and 1 tbs softened butter in a baking pan. Bake at 325 °F, stirring frequently, until toasted and browned. In a bowl, whisk 1 cup softened butter and 1 cup packed browned sugar until light and fluffy. Add 1 egg yolk and 1 tsp vanilla extract. Gradually sift in 2 cups self-rising flour and mix well. Cover and put in the fridge for 1 hour. Make 1-inch dough balls and roll them in toasted pecans. Bake at 375 °F until golden brown. Be sure to make enough cookies to treat your family, friends, neighbors, and co-workers. But keep in mind that some people may be allergic to pecans.